Vicky Rai, the son of a high-profile Minister, has been shot dead by one of the guests at his own party. They are a glitzy bunch, but among them the police find six strange, displaced characters with a gun in their possession. each of them steaming with a secret motive. India's wiliest investigative journalist, Arun Advani, makes it his mission to nail the murderer. In doing so, the amazing, tender and touching, techni-colour lives of six eccentric personalities unravel before our eyes. But can we trust Advani? Or does he have another agenda in mind...? Vicky Rai, the son of a high-profile Minister, has been shot dead by one of the guests at his own party. They are a glitzy bunch, but among them the police find six strange, displaced characters with a gun in their possession, each of them steaming with a secret motive. A dazzling mystery, a rivetting whodunnit, a kaleidoscopic portrait of modern India. Vikas Swarup is a member of the Indian Foreign Service and Q&A is his first novel. An international sensation, it has been translated into over forty languages, and was recently made into the multiple Oscar-winning film SLUMDOG MILLIONAIRE. 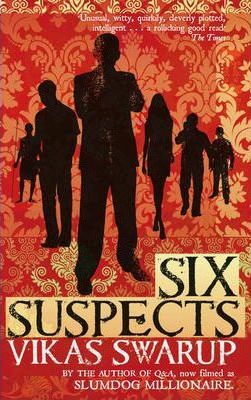 His new novel Six Suspects is also available as a Black Swan paperback.